Since moving to America three years ago, I've been regularly buying DVDs from my local Big Lots for $3 each. 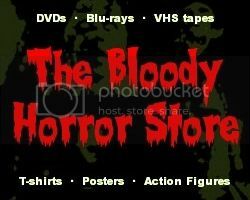 Various sites have attempted a "Master List" of all the titles they were selling, but none have made a definitive horror DVD list... until now that is. Here it is. If I find any more, I'll add them to the list. Titles and restocks vary from store to store, so what you find in one may not turn up in another Big Lots for ages. Happy hunting!